Oncology is a specialty within medicine that deals with analyzing, diagnosing and treating cancer or neoplasms. Medical professionals who deploy oncology are known as oncologists and are responsible for determining, once detected, what is the best method to treat the patient’s type of cancer. Radiotherapy, surgery, chemotherapy, or other practices, are among the most widespread in this regard. Here are the top five oncologists in Karachi based on internet research done by users. With 27 years of experiences in the field of oncology and his achievement of being the consultant physician in a remarkable hospital in KSA, Dr. Sabir Hussain is one of the most well-known Hematologists and Oncologists in Karachi. Dr. Sabir hold degrees of MBBS and specialization in Oncology and Hematology and is also the member of PMDC (Pakistan Medical & Dental Council). He is currently providing his services at Pak Onco Care in Karachi. Through the passion that Dr. Amna Masood possesses, she has built her name as one of the best oncologists in town. In 12 years of her experience, she has dealt with a wide variety of oncology-related diseases which has given her command over her profession. She is currently providing her services at Pak Onco Care in Karachi. 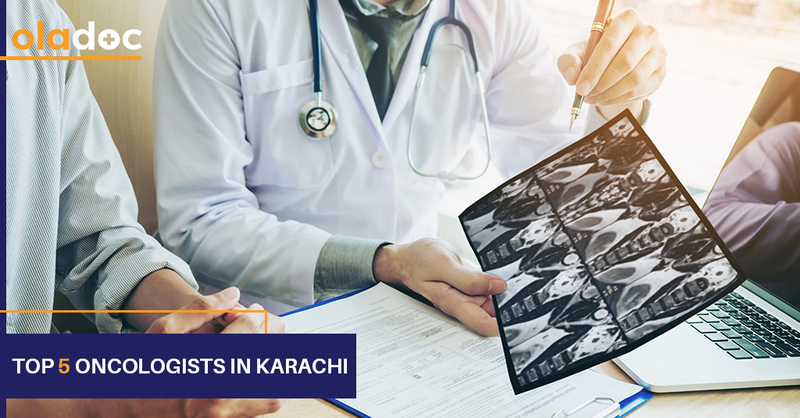 With the experience of 20 years as a practicing oncologist, Dr. Azhar Rashid is providing his services at Neurospinal & Cancer Care Institute (NCCI) in Karachi. His vast experience, degrees in MBBS, MSc in Oncology from the UK, and FCPS Radiotherapy, along with his membership at ISRS, RSS, PSCO, and ASTRO have earned him a massive amount of respect. He is currently providing the following services. Dr. Adeel is an FCPS qualified oncologist and is utilizing his 10 years of experience at Saifee Hospital and Medicare Cardiac & General Hospital in Karachi. Dealing with multiple diseases and having a good grasp on the knowledge of oncology drugs, he has been successfully treating his patients and providing good results. Dr. Asghar Hussain is one of the best oncologists of karachi with his staunch dedication, effective decision making and excellent communication skills. He qualifications include an MBBS, FCPS, MSc and he has a profound amount of experience in dealing with a wide range of oncology-related diseases. Currently, he is serving patients at Memon Medical Institute Hospital and Darul Sehat Hospital in Karachi. You can find and book an appointment with top oncologists in Karachi, Lahore and Islamabad through oladoc.com. You can also call our helpline at 042-3890-0939 for assistance to find the RIGHT Doctor for your health concerns.